This addon is for those players who are tired of the usual Factorization mod and want something new. Addon changes many recipes of Fz, adding new components in crafting. Some of them are made in the mechanisms such as the compressor. You will find below the recipes of mechanisms. - Support for MCPE 0.14.0 and Factorization 4.9. - Code is now located in the addon folder, while made the optimization and was created API for creation of instruments for FZ addons. - Fixed Factorization bugs with glass and iridium ore.
- Changed some crafting recipes from FZ. - Honey cookies. Restores 4 hunger units and gives the effect of regeneration II for 4 seconds. Energy storage: 30.000 Ee. In the sun, you will apply the effect of blindness. 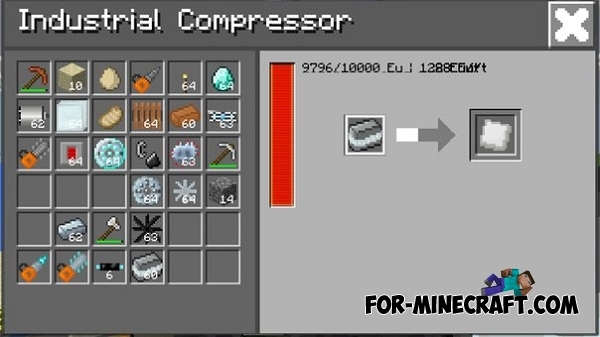 This is required for crafting nano-helmet. Disassemble the various electronics on the components: circuits, power tools, etc., except high-tech items (vajra, iridium drill, quantum, etc.). Sometimes with small losses. 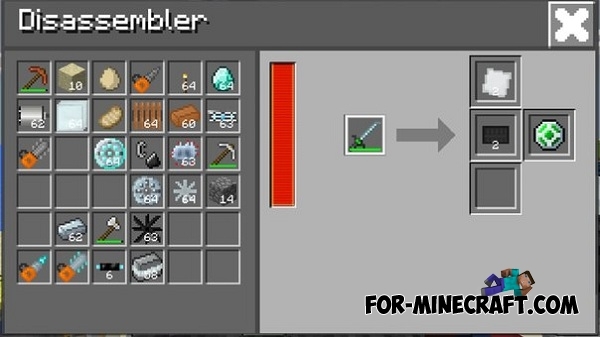 For example, when disassemble the nano-sword (glowstone dust not saved). Overall a useful mechanism that allows usefully to get rid of unnecessary junk. Now it works. If you click on the teleport, it will set as the teleportation point. A full charge lasts for 2 teleportation. 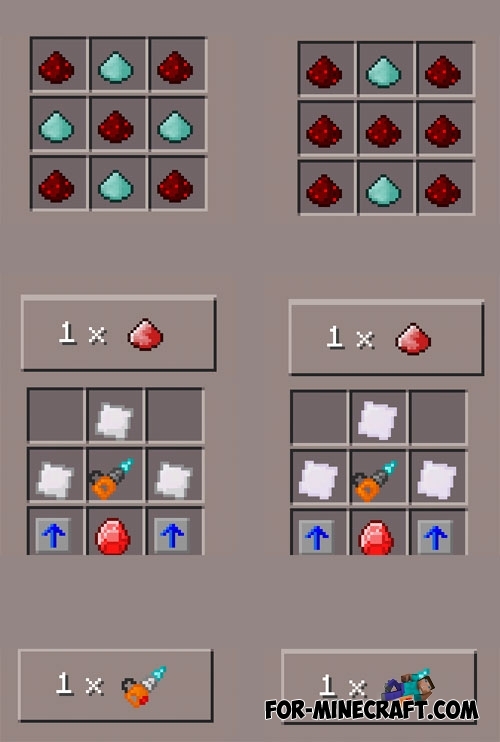 It can to extract blocks (alternative to iron picks and shovels). - Silicon grinder replaced by steel, has also been added a diamond grinder which is needed for masticator. - Now the silicon wafer obtained by compression of silicon dusts in the compressor, silicon wafer workpiece is removed. - Changed the crafting recipes of a superconductor and Vajra core. 2) Install texture pack from it. - Almost a full port for Factorization 4.8. - Added a drop of quartz from the quartz ores when you use tools from the addon. - New recipes for quantum armor. Now, not only breastplate, but other parts of the armor needs to be improved machine module. In this beta version the developer is finally ported addon to Factorization 4.7.3 (fixed all crafting recipes that contain the old IDs). - All mechanisms of addon have been added to creative mode. - Modified plating ID of mechanism for 19 (replaces sponge) because the ID 255 belongs to one of the pipes. - Changed an alternative crafting recipe of bucket, because illogic, so now you can use for crafting steel. - Salmon and grilled salmon are now displayed in the interface of mechanisms. - Now the teleport uses a texture of improved engine block instead of the ordinary. Also centrifuge texture was modified. 1. Install texture pack (!!! important: addon texture must be installed after fz textures to avoid texture bugs). 2. Unpack the second archive. 3. Copy folder from second archive in games / com.mojang / Factorization addons. 4. Install script from the archive. - Support for 0.12.1 (addon worked, but with bugs of textures). - New wind motor texture. - Improved wind motor that generates 5 times more energy than usual, up to 500 Ee / second (at the upper limit of the world (z = 128), as in the case with a conventional wind motor. Energy is produced less if the wind motor is located low). - Improved electromagnetic coil and carbon fiber blades - crafting ingredients of improved the wind motor. - Improved solar panel generates 200 Ee / second in the daytime. - New wire (craft ingredients). 0) Required Factorization mod 4.6 or newer version (when released Fz 4.6.1 or 4.7, addon it will work fine). 1) "HighTechCraft" folder copy in games "/ com.mojang / Factorization Addons" (but first remove the folder with the old version of addon). 2) Install the texture pack from the archive. 3) Install the "HighTechCraft_1.4.3.js" (The script has not changed, so you can not reinstall it). - Bronze dust, which can be melted into bronze ingots. 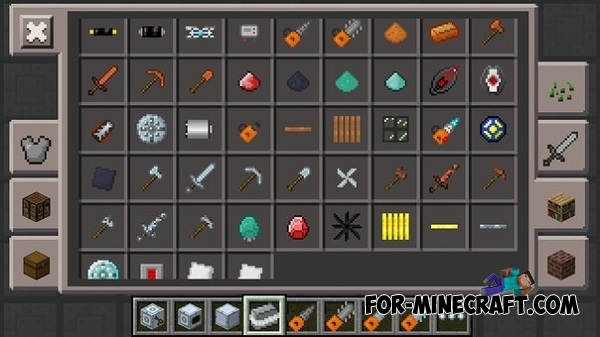 - Bronze tools and armor (similar to iron, but less durability). - Steel tools (1.5 times stronger than iron). - Composite armor (like diamond). - Vajra is electric tools which has energy storage (1 000 000 Ee). 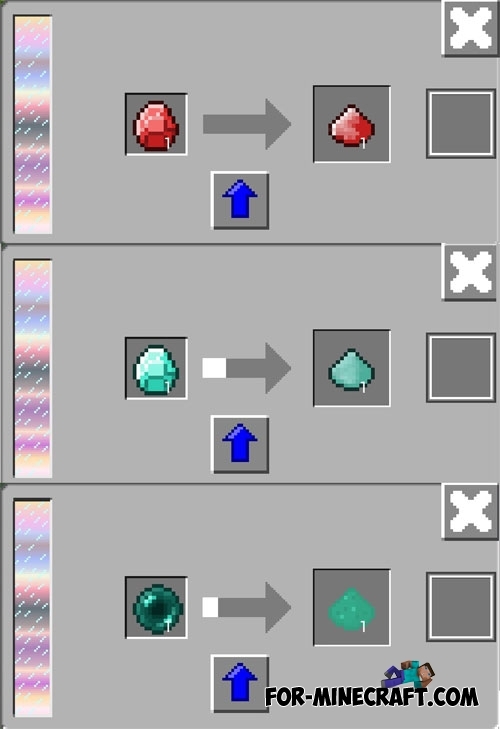 This item instant breaks all blocks except bedrock. Also it gives 25 points of damage to mobs and set fire to them. Every action takes 333 Ee. 1) "Fortune III mode" In this mode, the drill is spending 80 Ee breaking the block and works as an enchanted for luck. 2) "Silktouch mode" In this mode, the drill is spending 160 Ee breaking the block and works as an enchanted for Silk Touch. 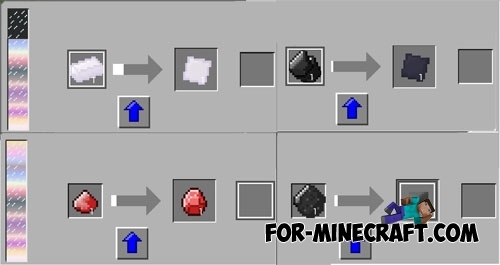 3) "Destroy 3x3x3 mode" This mode resembles the standard, but the drill breaks all blocks that you can to extract with a pick or a shovel, in the area of 3x3x3 blocks. Drill is spending to 80 Ee for each broken block in this area. 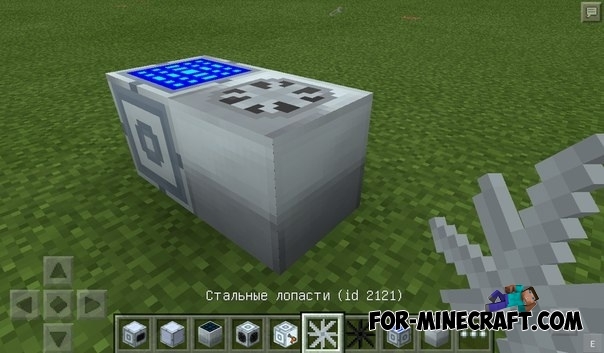 - Improved solar panel, generates 200 Ee / second in the daytime (10 times more than that of ordinary panel), and at night the generates 20 Ee / second. This version of the addon for Factorization 4.5 (4.6, 4.7, and so on will work). 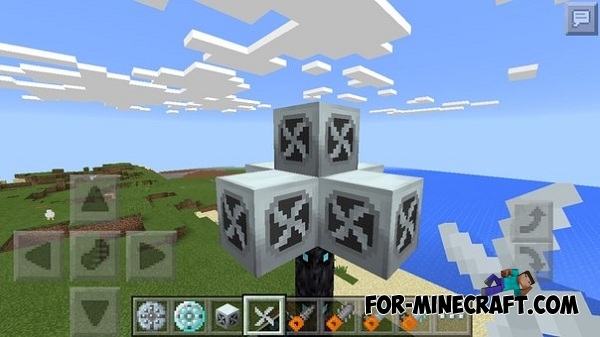 There are a couple of bugs: graphically the wires will not connect, and texture of some blocks will be incorrect. !!! needed Factorization 4.5, download and install it. 1) From the archive "HighTechCraft" folder copy in "games / com.mojang / Factorization Addons". 2) Install the texture of addon. 3) Install the script "HighTechCraft_1.4.3.js". 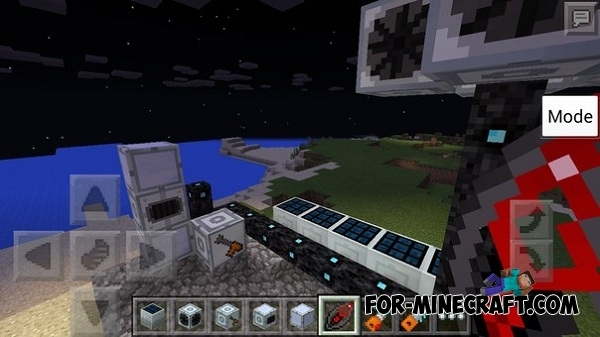 Factorization 3.9.1 mod for MCPE 0.10.5Version in which all the expected thin wires become a reality! Now, including improved graphics in the game settings, you can make thin wires on the PC version! It looks great but how do I put it on minecraft? How do whe get this mod on ? I don't really know how to do this.